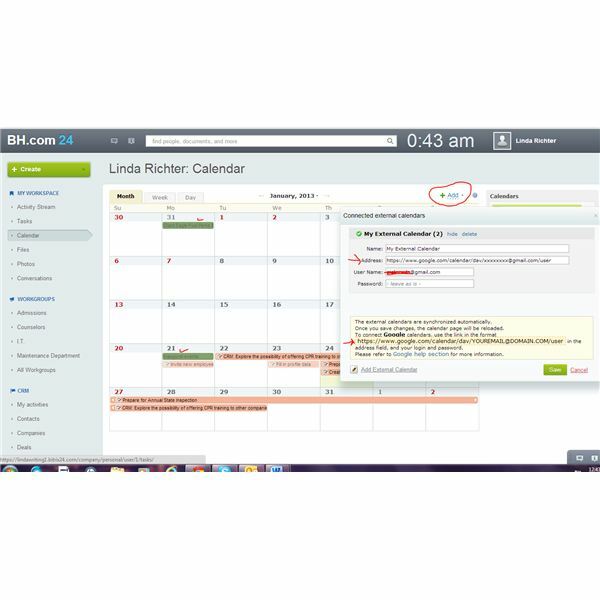 Bixtrix24 incorporates the easy functionality of a Facebook-type Intranet design into a multifunctional platform for managing tasks, time, and work documents in the course of your business day. Whether you’re a project manager or a mid-level department supervisor, you’ll find ways to put this SAASy software to work for you. There are several versions: The free version for small companies (evaluated here), which allows up to 12 users and provides 5 Gb online storage; the Standard version, for any number of employees and providing 50 Gb online storage for $99 per month; and the Professional version offered with 100 Gb online storage for $199 per month. The free version does not offer Extranet availability, but the other versions do. Once you sign up, Bitrix24 assigns a URL string. Using the security prefix https://, type that string in your browser to access your Bitrix24 site. If you just go to the company's website, there is not a login button. When you launch Bitrix24, the Help window pops open. It’s a series of ten slides that give you an overview of Bitrix24’s various features. Once you go through them, you’ll come to realize that you really can’t get far with the software until you invite your contacts. You cannot list someone as a contact, participant, or observer if that person has not accepted an invitation from you. The person does not have to be online after accepting your invitation, but you cannot add them as project participants or observers if they have not accepted your invitation to join. To this end, an explanatory letter to your staff will pop up when you open Bitrix24. Insert their email addresses and send off the invitation. In order to take this software out for a ride, I entered my own information and created an alter ego (so that I could invite myself using a secondary email address) named Queen of Sheba. I added a few other people, too, and created two projects, one for employee training and one in preparation for an accreditation site visit. The Activity Stream really is like Facebook, showing a constant list of your activities and communications throughout the day. 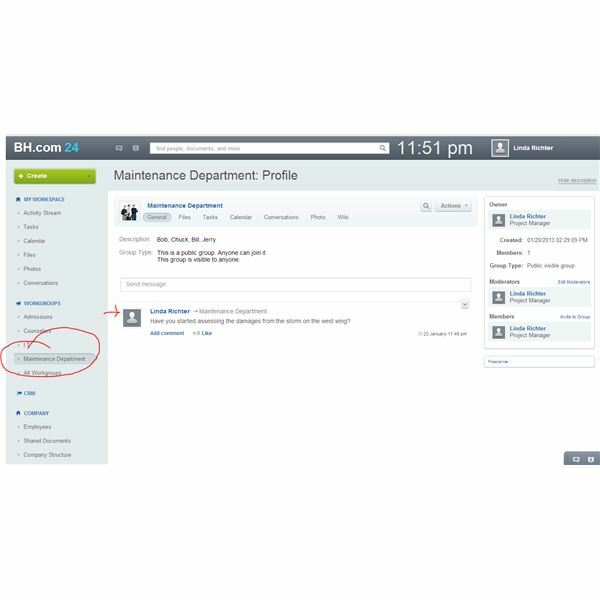 Your colleagues can add comments to your entries, and they can opt to follow any of the various entries you make so that they can be updated whenever there’s a new comment or activity on a specific task or event. Below the Activity Stream label on the left-side panel you’ll see Tasks. Click on Tasks and you can view your current tasks and create new ones. 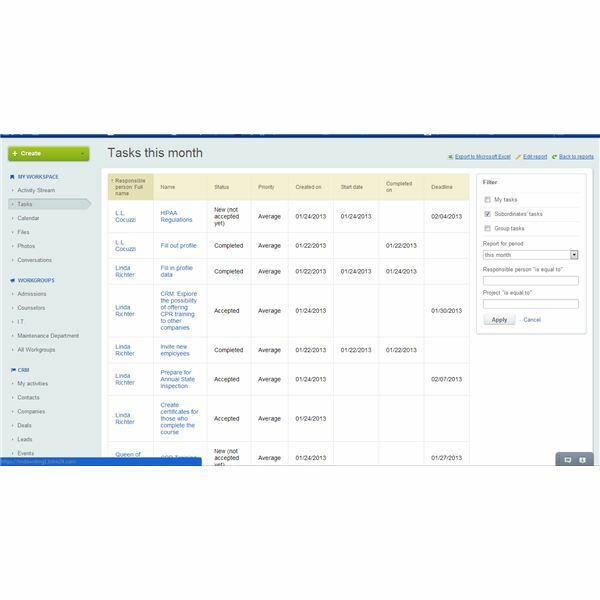 Look on the right-hand side to see all tasks or use the filters to view only subcategories of tasks. You can export your tasks to Excel or Outlook, too, by the way. Your Calendar comes next. Enter events directly on the calendar, or let the calendar pick up dates from your created tasks. It will show a stripe for each task and event that you’ve entered, and you can color-code them. Once you’ve added colleagues, you can ask them to share their calendars with you also. A wonderful feature is the ability to synchronize the Bitrix24 calendar with your preferred desktop or mobile calendar or even the Mac OS. For this you will click on Add, and from the drop-down window (for Windows) choose the CalDav option. From the image below you can see the string you must type in, and the calendar shows my Google events in green and the Bitrix24 entries in salmon. The Files tag lets you access any documents that you upload to Bitrix24 for your tasks. Click on Edit to customize the headings that are displayed. As your work on Bitrix24 grows, you will want to create folders so that each task or workgroup has its own set of files. The Photos category lets you upload any visuals that you need, from photos of colleagues to just about anything. Next, you can create Workgroups. Bitrix24 opens up with several pre-named workgroups. You can edit them to give groups names relevant to your operations. Each Workgroup will have contact lists, calendars, tasks, and so forth. I renamed mine as the departments you might find in a social service agency—Admissions, Counselors, IT, and Maintenance. You can see I sent the Maintenance group a message about recent storm damage. The message will also show up in my Activity Stream. Next is CRM, your customer relationship management tool. It allows you to import both leads and contacts. You can create a task or event relative to your client or workgroup contacts, designate participants or observers, and send messages. Notice in this screenshot I’ve created a task for my idea of offering CPR training to other companies and I want Queen of Sheba to present a cost analysis. I’ve also begun a date and time log for this event. There is a Company section, complete with charts for documenting absences. You can upload tools or documents useful to employees, including an employee manual, for example, and an organizational structure. Bitrix24 opens with a basic organizational chart; you can edit it and add to it to suit your company’s organizational structure. There’s a Gantt chart available on the top right-hand side of the Tasks section. Click on it and you’ll be able to visualize the spacing of your task dates. 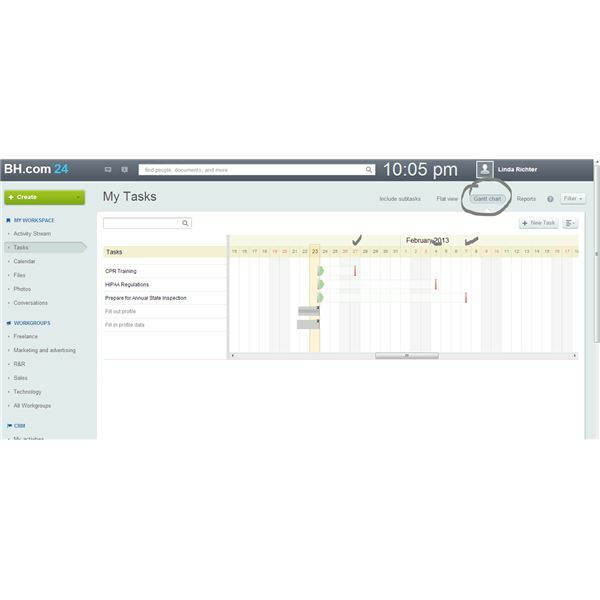 At the top right-hand side of the Gantt view you’ll see the ability to add tasks from a template. First you have to create a template, and once you add it, you’ll be able to adapt it for similar tasks or re-use it for tasks that occur at intervals throughout the year. 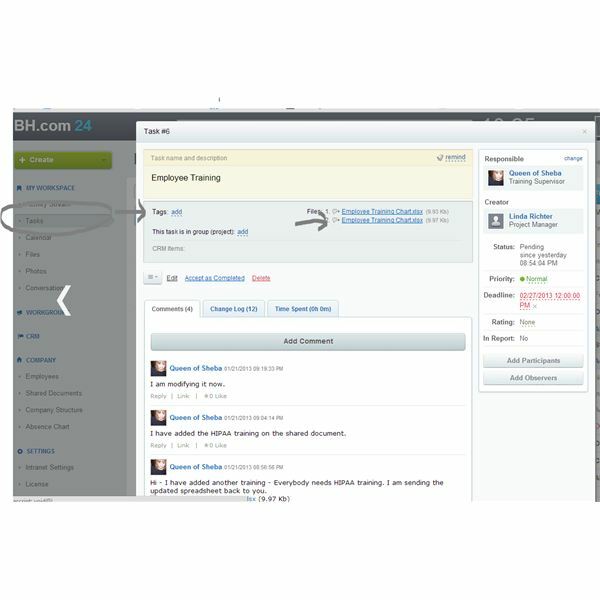 As your Bitrix24 site grows, you can upload both broad and general documents. Under the Company heading in the left-hand panel you’ll see a file for Documents. 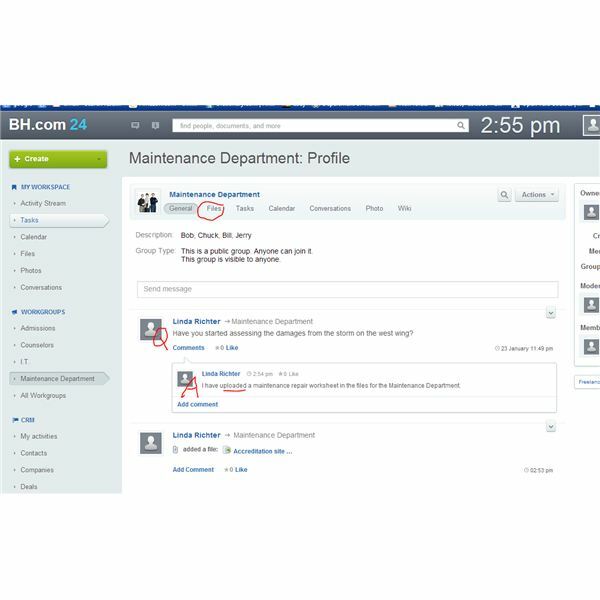 While you can upload documents and make them available for those working on specific tasks, you can also upload documents—an HR manual, for example—that everyone on the Intranet can access. 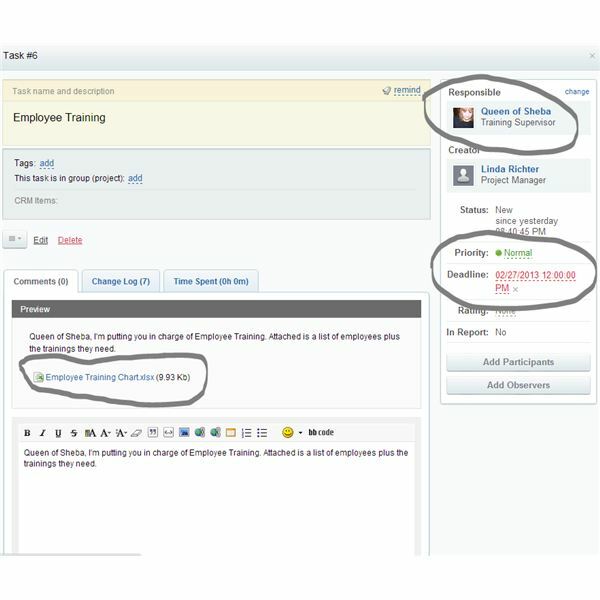 You can also create a Wiki within various Workgroups where you will insert text, links, and photos as necessary for your team. Bitrix24 also contains Report wizards that will let you create a wide variety of documents and reports for your staff or stakeholders. 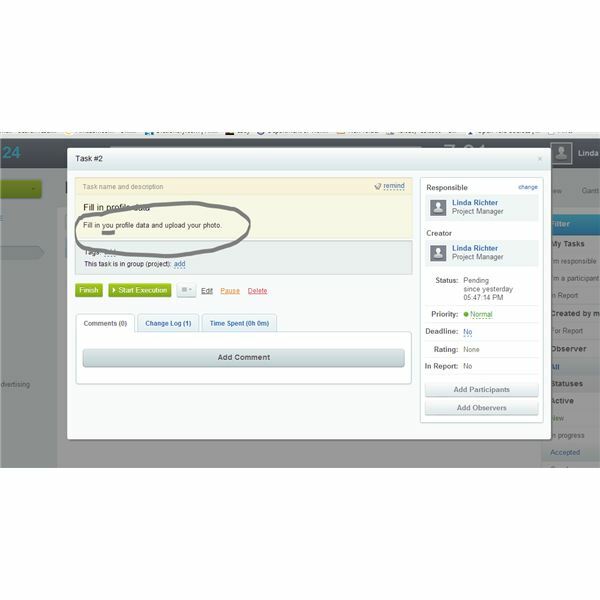 If you share documents with clients on the Extranet, they can also access them. Particularly useful for the free version, which limits participants to the Intranet only, you can create reports and export them to Excel. You can then export your Bitrix24 contacts to Outlook. From there it’s only a few clicks to send a report to all your contacts. An added feature is the ability to collaborate on documents. You can see that I created an Employee Training document and shared it with Queen of Sheba, who then modified it. All versions of the document are available on the Task tab. I would give this a 4 or 5 rating except I had so much trouble finding help. There is no one-on-one help or any way to contact Bitrix24 with user questions. I tested the free version, but the chart that shows features of the for-cost versions does not identify a Help feature, either. I found it rather frustrating when I opened it for first-time use; maybe Bitrix24 could incorporate tips visible if you mouse over problem areas, for example. Bitrix24 offers you access to a great user forum, but I had a heck of a time finding it. Once you find it and browse through it a couple times, you’ll grudgingly begin to admit that it may be quite helpful. There are some terrific blogs, located in yet another spot. I particularly liked the entry by Stephen Ankenman about using the workflow modeler with templates he created. He has also created an interesting entry about using Wikis. Bitrix24 is available for use on mobile devices, as well, and Alex Reznor wrote a useful blog about that. 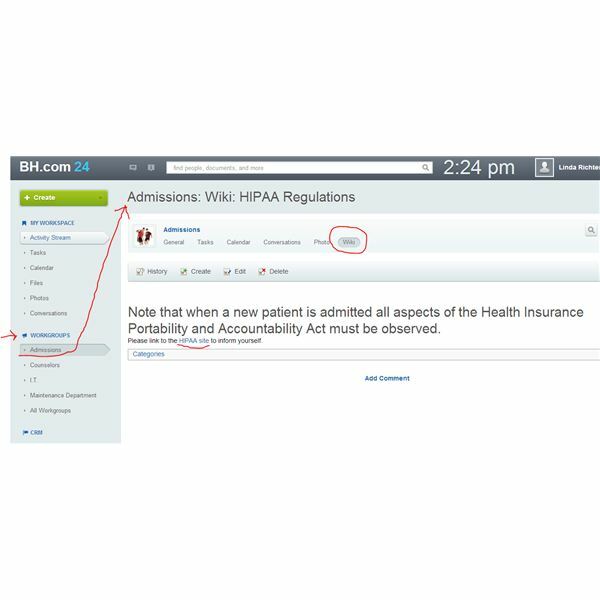 You will not see the blogs when you’re logged into your Bitrix24 Intranet. You must revisit the main page and scroll down to the bottom, where these great blogs are accessible only through a little, tiny link. 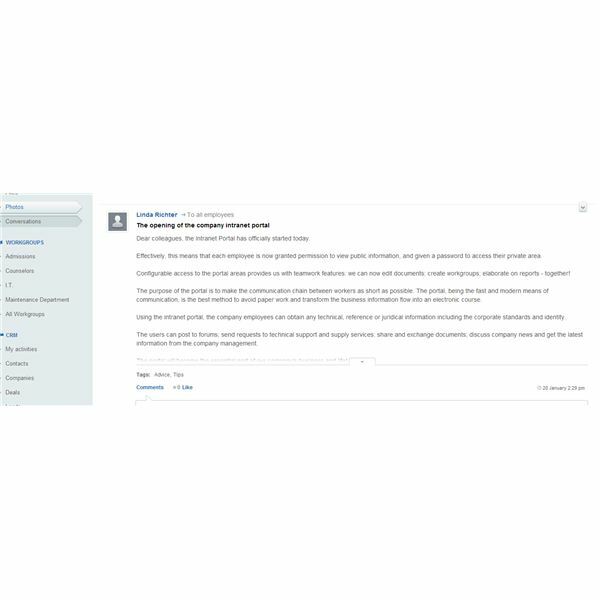 This could be really good help if you could avoid frustration by finding the Forum and the blogs more easily. How about making them more readily visible, Bitrix people? There does seem to be an issue with setting the right calendar date. I noticed that when I created a task, Bitrix24 identified it as created yesterday. In the Forum, a couple people mentioned that when they click into one calendar square, the square immediately preceding is selected. The Bitrix24 people promised to fix this in the forum, but there are apparently still a few rough edges to be smoothed out. There are a few minor typos here and there—see one in the image below. True, it’s not a biggie, but if you offer an important stakeholder access to your Bitrix24 via the Extranet, it doesn’t make a good impression for someone to see typos. It would only take a few bucks and a little bit of time for the Bitrix folks to clean up those little errors. Last but not least, I wish I could add participants or observers even if they haven’t accepted my invitation to join Bitrix24. At my company, we have certain categories of employees that have email but rarely access it. I’d like to assign my maintenance guys to various projects in order to prepare for the accreditation site visit, but since they didn’t respond to my request I can’t plot their assignments using the software. 5 out of 5; Excellent! After the initial frustration of having to figure out that I really could not get far until I invited my other contacts, I found Bitrix24 to be rather intuitive and even fun. It lets you combine your tasks into a cloud area so that you can access your stuff even if you’re at your mother-in-law’s house. You can manage and share documents, watch your own plus others’ calendars, send emails to your clients, and calculate sales figures, all with a platform for the easy chatting style that we have all come to know and love from comingling on Facebook and Google+. You can’t beat the free version for value, of course, but for a small business even a C-note a month is not a bad deal. Give the free version a try, and if you like it then you can upgrade. The writer is an experienced reviewer and utilizer of project management software.